After two months of preparation, working out locations and practicing heights and angles, we film Rain Dance. Vicky is the Goddess of precipitation. We only have six days together at Komsberg and the weather is unsuitable for flying/filming on two of these days. But, thankfully, we are successful with four sunrises and two sunsets. 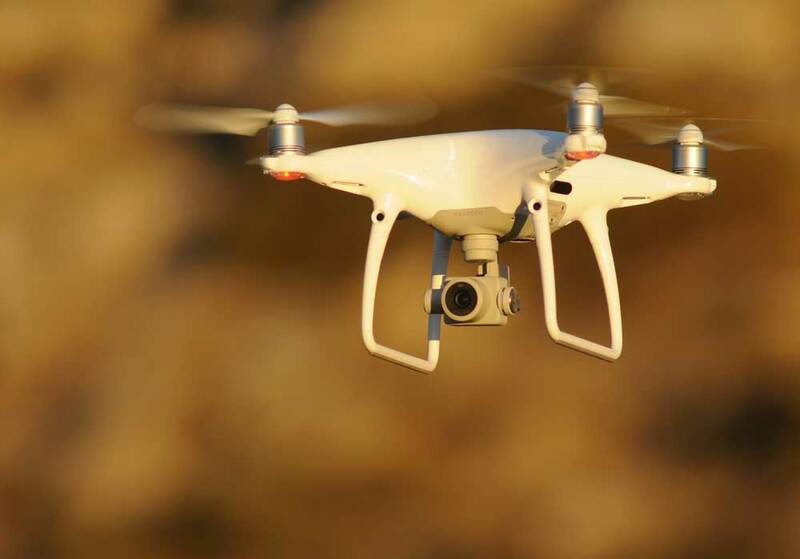 To watch the film, see our Drone Ranger page. The short film ends with an important message - plus, finally, news of a downpour. The drought causes lots of extra work. 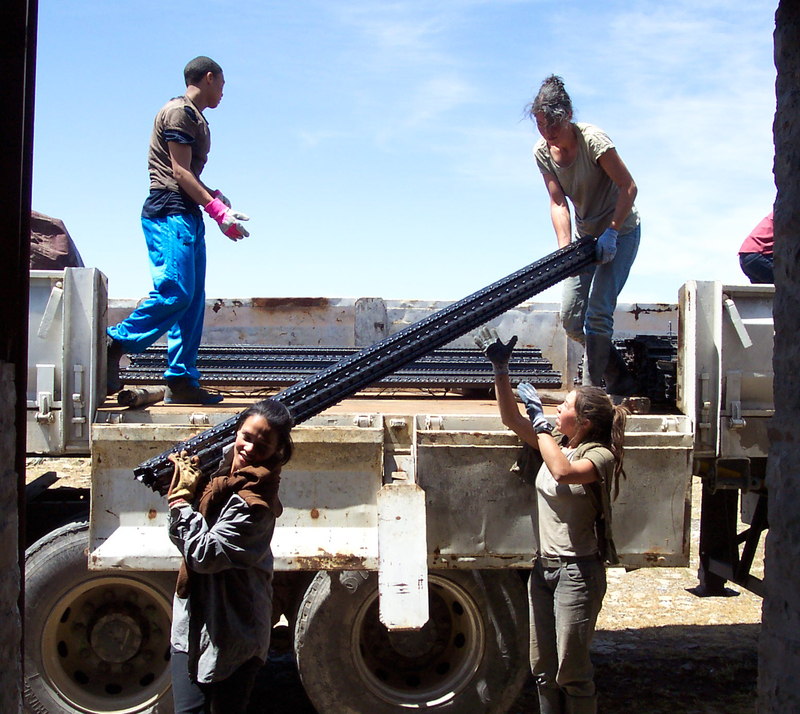 A 22m long lorry transporting “food aid” for the animals has to be offloaded and stored. Then, every couple of days, it needs to be put out in several places on the reserve. Waterholes need checking twice as often as normal. We make another short drone film titled Fifth year of drought. 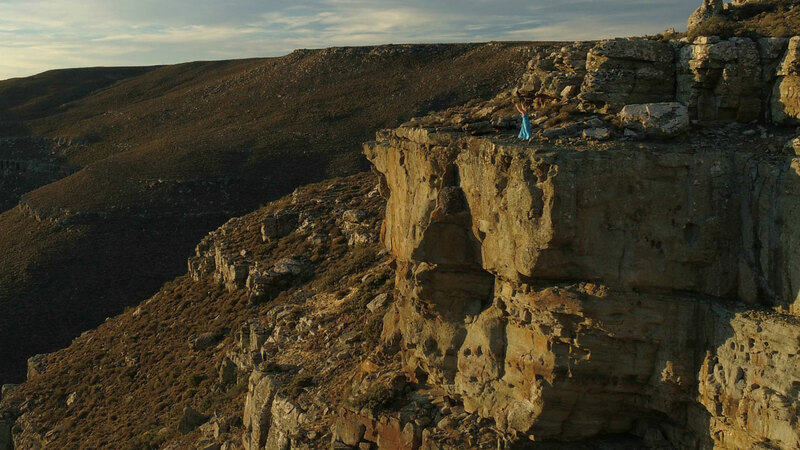 Our Drone Ranger film Drought - and the other three short films – summarise what we have been doing during this difficult time. We have had three drought summers in a row. The winter rainfall (April – August) failed this year. A fourth dry summer would be disastrous. We urgently need rain. Lots of it. Komsberg’s vegetation includes many succulent species. 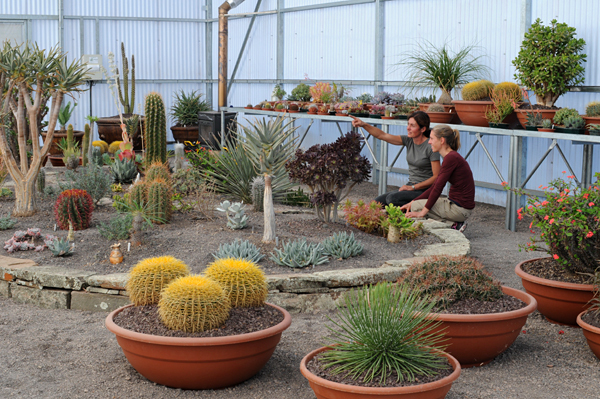 A new greenhouse collection of succulents, including cacti, from around the world provides a brilliant educational introduction to this unusual group of plants. Honour (the springbok that we hand-reared in 2014) now lives independently in a large area next to the homestead. We are proud to announce that she gave birth to a healthy baby in October 2016. On 7th June 2016, a game capture team took off surplus animals from Komsberg West: 31 black wildebeest and 6 gemsbok. They were not for moving to another reserve, but rather to re-introduce the species on our own Komsberg North. These large antelope were expertly netted from a helicopter. At one point, Vicky went up in the helicopter to search for gemsbok. In Vicky's own words: "What a privilege and opportunity to see Komsberg from the air! The ride was absolutely ecstatic. It was an inspiring experience, seeing the magnificence of Komsberg in all its splendour - what an amazing land." A week later, we received more good rainfall. 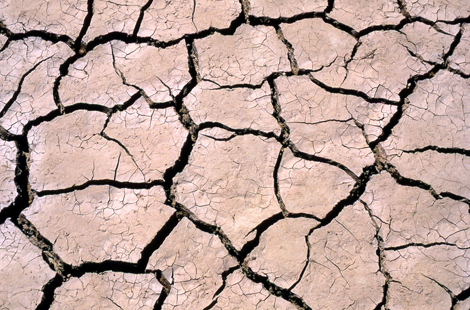 The drought in South Africa has been the worst in over a hundred years. We have been providing lucerne and mineral licks to help our animals through this difficult time. Thankfully, none have been lost as a result of this severe drought. The winter rains must begin in May. We are proud to announce that Happy (the black-backed jackal that we hand-reared) has become a parent. He has two youngsters. Rainfall for this year has been the lowest in over 50 years. We are in drought. A major global El Nino event might be one factor. For now, our animals are in good condition - but we urgently need rain. 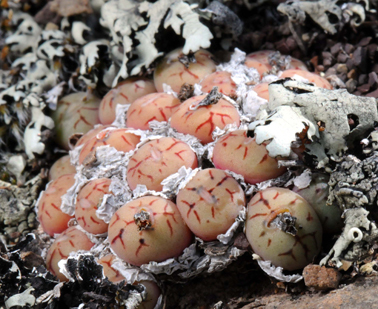 Komsberg has many succulent plants, but we have found Conophytum minimum. It's quite a long way outside the previously known geographical range for this genus. Five more Cape mountain zebra foals have been born recently. Becky and Iain were lucky enough to see one of these born in front of them on a mountain's edge. Our growing population of this endangered species now numbers 30 animals. Vicky is hand-rearing a baby springbok that we were kindly given by a game capture team. We've named her Honour and she's living with us in the house. The photo was taken of Honour in the first snowfall of this winter. Eskom (South Africa's supplier of electricity) kindly support our work by donating large wooden poles for further strengthening of our perimeter fence. Also, three companies donated a chainsaw, safety helmet, and protective trousers so that we can cut the long poles into usable 3m fencing posts. Eland are reintroduced to Komsberg North. 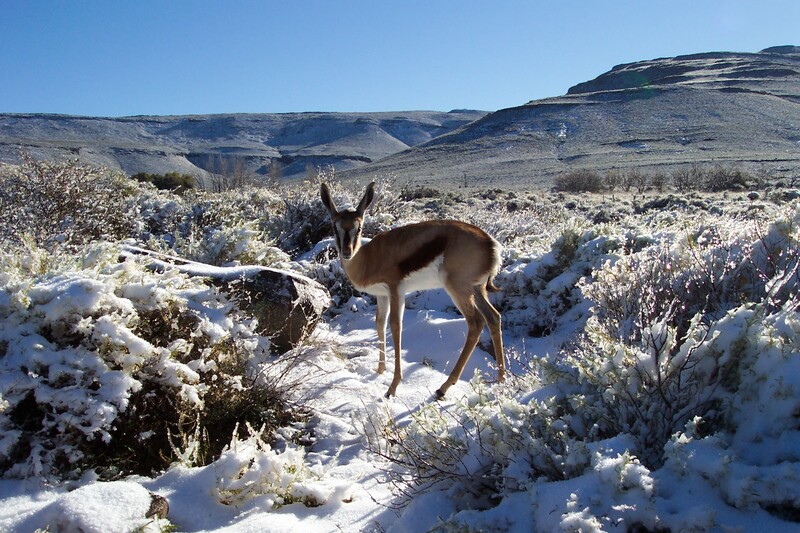 This is our 11th antelope species or 13th large herbivore. Eland are big animals, weighing 600-700kg each. They are mixed feeders, meaning that they browse the leaves of bushes and trees, but also eat grass. One of two new camera traps recently donated successfully captured pictures of the elusive Cape clawless otter. 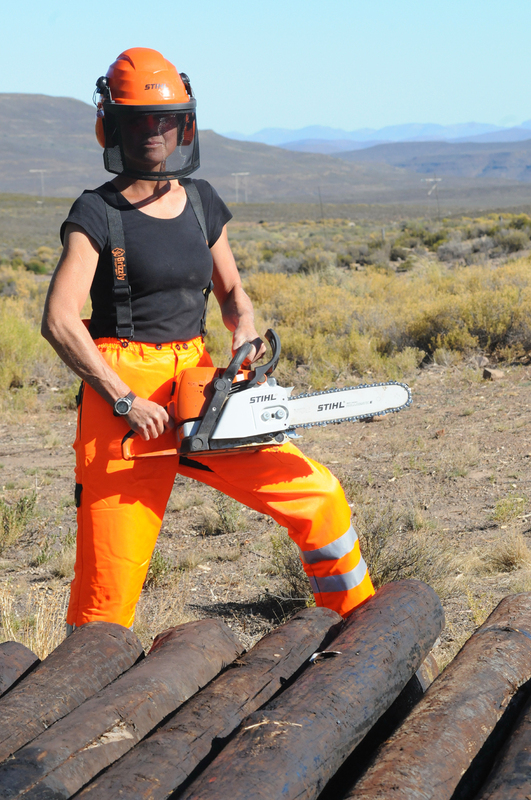 It's hard to believe that this aquatic specialist survives in the dry Karoo region, yet it does. Our river vegetation has dramatically improved in the past ten years, no doubt aiding the Cape clawless otter’s recovery at Komsberg. Animals especially use the waterholes at this dry time of the year. Two camera traps are positioned for taking photographs of kudu. These large antelope can be individually identified by their unique stripe patterns. 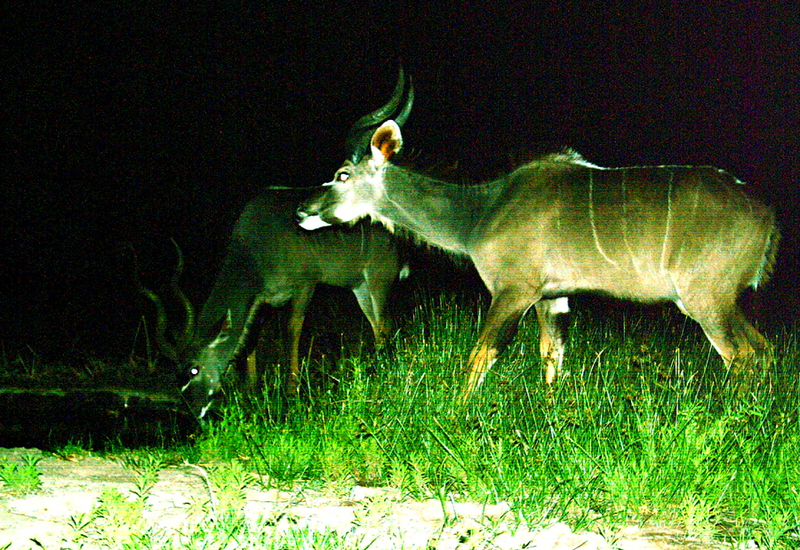 We are building up a good collection of photographs that allow us to monitor the size of our kudu population. Anton owns a mechanics business near Worcester. He generously helps by repairing and maintaining our vehicles, making a round trip to Komsberg of 470km (292 miles) whenever necessary. Once, a vehicle had gone wrong and stopped half way down one of our steep mountainsides - his strangest ever call out. Anton is like an unofficial member of our team and we are extremely grateful for his support. Greater flamingos are still on three of our larger dams. And we get 110mm of rain - one third of our annual total - in just one day on 14th December. We would like to thank everyone for their support and wish you all a Merry Christmas. The photo was taken in June during the South African winter. A group of learners from our local school join us for the day. We spend the morning driving and walking around, watching animals, and discussing how to make dreams become a reality. They then decided to help us offload a delivery of 2,000 metal Y-posts, 9.8 tonnes in weight. We got it all done in 1hr 20min - a valuable lesson in the importance of hard work. Disaster struck on Friday 13th July. Freak weather, never seen before in 70 years, brings down 35km of our perimeter fence. Part of our successful attitude is "facing reality" and "never give up". We get it back up, initially in just four days. In September, Atlas Copco generously donate a rock drill to help us further strengthen the fence. Read more by clicking here. Three Cape clawless otters are seen sunbathing and playing together on the riverbank at our main homestead. An amazing sighting of such an elusive species. We are delighted to announce the birth of two more Cape mountain zebra foals, (now four in total). Other recent additions include 15 black wildebeest babies and 12 blue wildebeest babies, all doing well. New team members get extra training at Komsberg. Wendy comments: "I have been shocked by the vastness, despite prior warning that it is a big place." Rachel adds: "The dedication and determination of the team needed at Komsberg is inspirational and matches the huge wilderness. Being here has given me even clearer goals about the attitude that is required to achieve what is necessary. I am not prepared to do less than my best." Our first two Cape mountain zebra foals have been born, 13 months after nthis endangered species is reintroduced. We haven't hand-reared any baby animal at Komsberg in the past decade - until now. 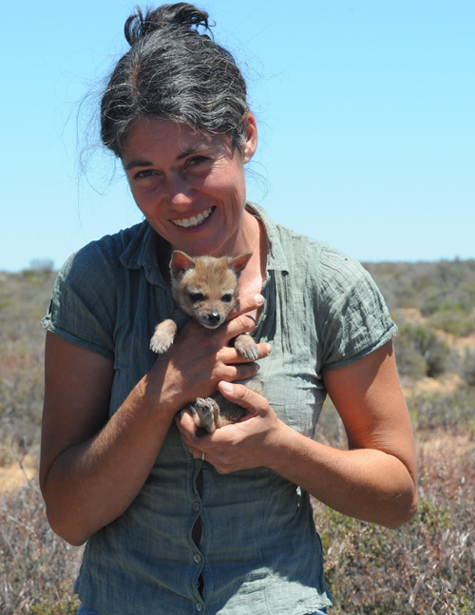 At the beginning of October, we began looking after a tiny orphaned black-backed jackal who we named Happy. He is intelligent and totally adorable. The unusually good rainfall continued through to August and, not surprisingly, this year's spring flower display was better than average. What a month! From the 1st to the 18th February, we've had a lot of rain - making this the best February since our rainfall records began 40 years ago. In fact, there have only been two other months of rain slightly heavier in all these years. So Komsberg is looking very green. Although overall welcome, one huge downpour washed away some of our roads; we had 47mm of rain in just 10 minutes. Our animals are enjoying the resulting new growth of vegetation and so are in great condition at what is normally the dry time of the year. And we've had lots of births – including four new Burchell's zebra foals and nine black wildebeest babies. 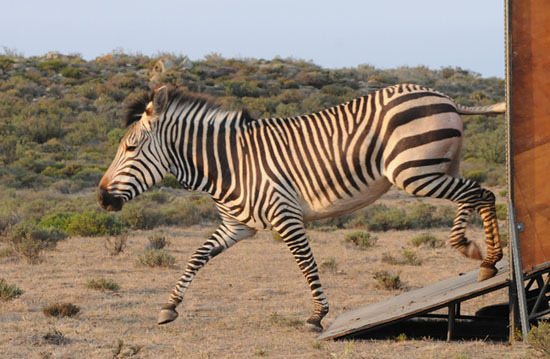 The recently released endangered Cape mountain zebra have settled in well to their new environment. They look fantastic on the steep mountain slopes of Komsberg West. The place is so big, it took us four weeks to locate one particular family group! The endangered Cape mountain zebra is re-introduced to Komsberg West on 7th October. Four small family groups plus an additional bachelor male are released. This species almost went extinct and there were only 91 individual animals left alive in 1950. 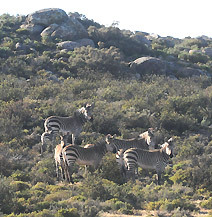 It is great to see these mountain zebra back on our numerous and dramatic mountainsides. Five zebra foals have been born recently, along with six blue wildebeest babies. These two species associate well together. We watched a caracal with two young hunt and kill a springbok. We then observed them eating over the next couple of days. Rainfall at the end of February and early March has been excellent. This is normally a dry time of the year, yet we have enjoyed over a third of our annual rainfall. Everywhere is looking lush and green. Our animals, already healthy, are in superb condition. Our first six black wildebeest babies are born. 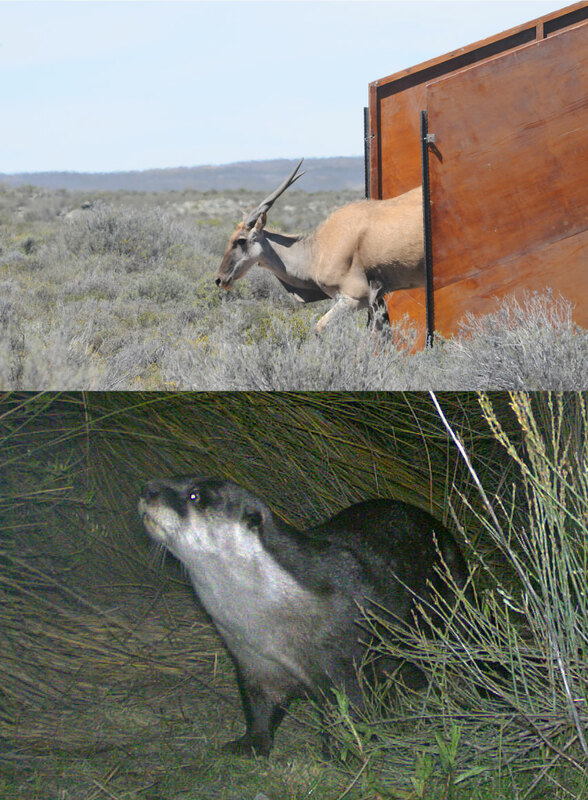 Gemsbok, red hartebeest, kudu, and springbok are also all busy giving birth. Komsberg has taken another step forward during this past year, with a major increase in the number of large animals. Yet another release of gemsbok takes place (our fifth). These animals, including a mother and baby, are off-loaded in the valley section of Komsberg West. 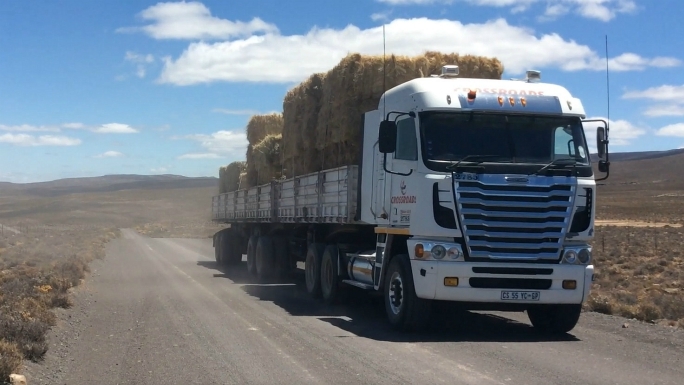 A delivery of springbok is off-loaded to the brandhoek section of Komsberg West. 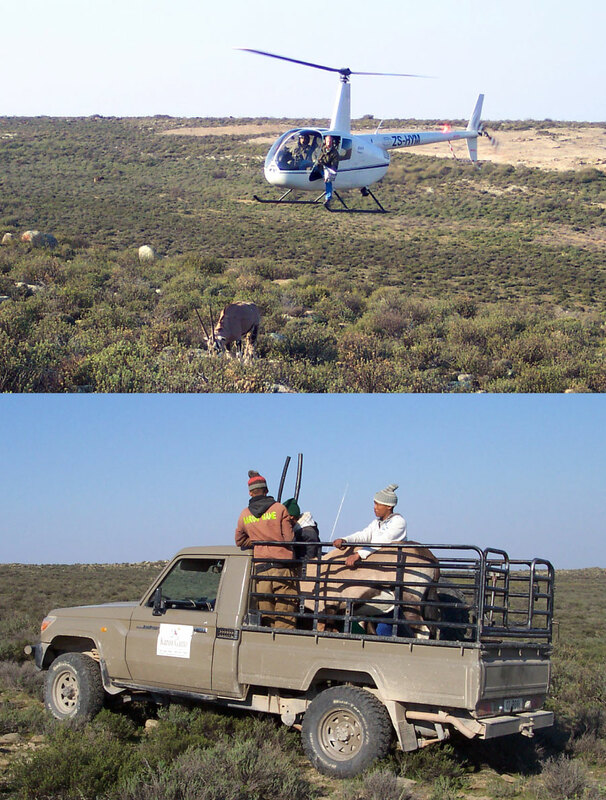 A few days later, 15 gemsbok are released to Komsberg East. Blue wildebeest are released to Komsberg East. As grazers of short grass, we hope they will complement the zebra and gemsbok which are both bulk grazers. Red hartebeest are selective grazers. Black wildebeest are released to the brandhoek section of Komsberg West. These black wildebeest faced extinction in the late 19th century when numbers crashed to approximately 550 individuals. Nowadays there are over 10,000 black wildebeest. Their long white tails distinguish them from the more commonly known blue wildebeest. More Burchell's zebra are released to Komsberg East. This includes a family group of seven. They stayed together as a family unit following their release and are regularly seen in waterhole valley. Added to the original zebra re-introduced in September 2008, we now have the foundation for our future population of Burchell's zebra. Our zebra are settling down. It is fantastic to see these iconic African animals at Komsberg Wilderness Nature Reserve. 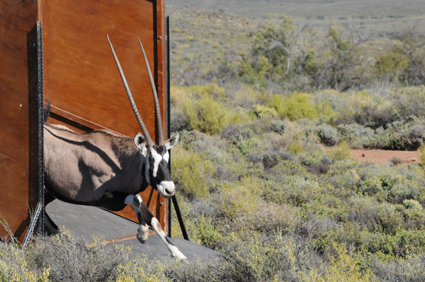 Yet another release takes place: gemsbok and more red hartebeest for Komsberg East. The old boundary fence that we erected over six years ago between Komsberg East and Komsberg East extension is removed, opening up a huge area. A small number of Burchell's zebra are re-introduced on 10th September; they have been absent since 1811 or thereabouts. Two days later, additional kudu are released in the valley section of Komsberg West to boost our existing population of these huge antelope and increase genetic diversity. 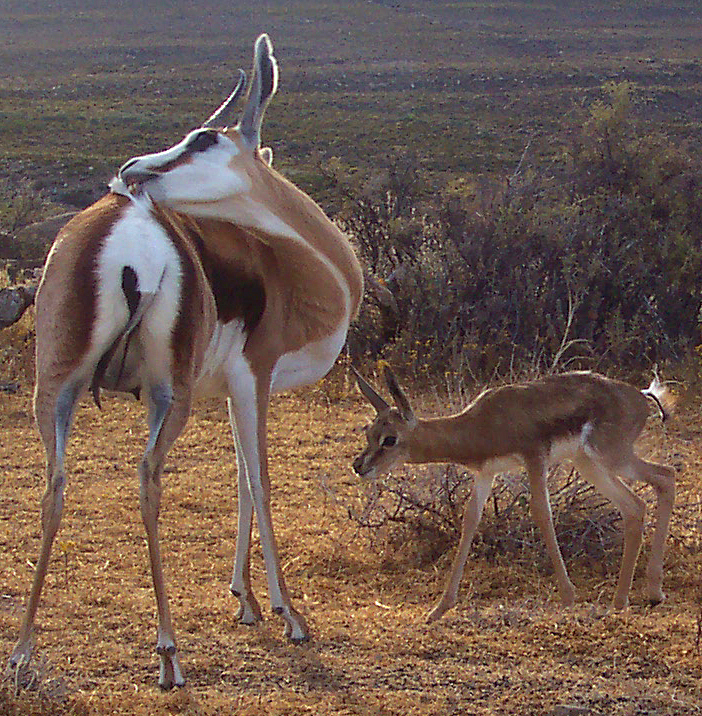 Two new baby red hartebeest are running around with their mothers, plus lots of springbok babies everywhere. Two gemsbok babies have been born early; we are expecting more births in October and November of these spectacular antelope. We finally finish fencing the perimeter of Komsberg East extension after a lot of hard work, ready for the release of additional animals during the next two months. Several sightings of our first gemsbok baby. A group of 17 gemsbok are being regularly seen on the plateau; a spectacular sight. They are all in excellent condition, with full bellies, and we are hopeful of more babies in October/November. Excellent viewing of aardvark and caracal. Based on the recent frequency of sightings of caracal, this locally persecuted species is recovering well. We appear to have no less than four Martial eagles on Komsberg at present: an adult pair and two juvenile/immature eagles. The Martial eagle is classified as being vulnerable to extinction in South Africa and endangered in neighbouring Namibia. There are only 100 to 150 Martial eagles in the whole of the Western Cape, Northern Cape, and Eastern Cape. Ours are being seen almost daily. Komsberg is a great place to see eagles and other birds of prey. Komsberg is having great summer rainfall after three previously dry summers. The endangered rye grass is flowering and everywhere is green. Christmas was wet! Both groups of eco-tourists see meerkats daily. Flamingos are passing through for the whole of November. One widely travelled guest who has seen wildlife all over the world comments this has been her best holiday ever! We do our best to involve guests in the running of our wilderness nature reserve, providing them with a special insight and experience. More gemsbok arrive to boost the population. 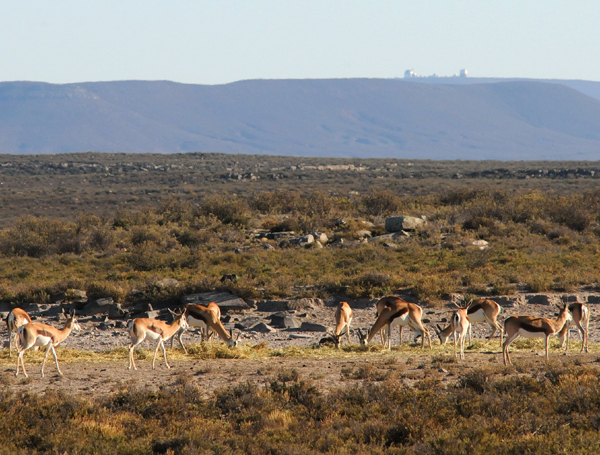 Released on Komsberg West's plateau, these spectacular 240kg antelope roam everywhere. Our first-born red hartebeest herself gives birth. The best few weeks of wildlife viewing yet! 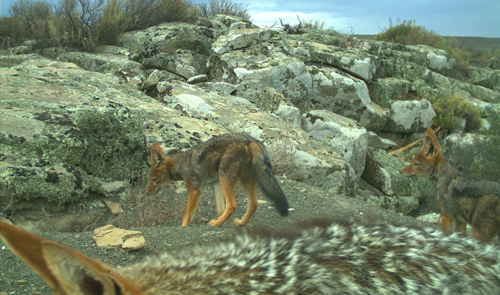 Including a caracal family and black-backed jackal, two locally persecuted predators. We now have a resident pair of martial eagles; one was seen hunting springbok. Gemsbok are re-introduced for the first time in approximately 200 years. Fantastic flower displays everywhere.... the best we have seen. Work begins on the new land, removing internal camp fencing and erecting a 2.4m perimeter fence. 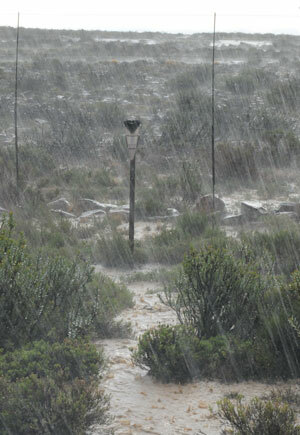 Heavy winter rainfall breaks the severe drought and kick starts the recovery process. However, massive downpours damage two large dam walls. We purchase an adjoining sheep farm, almost doubling Komsberg in size to over 30,000 acres or 17 miles in length. 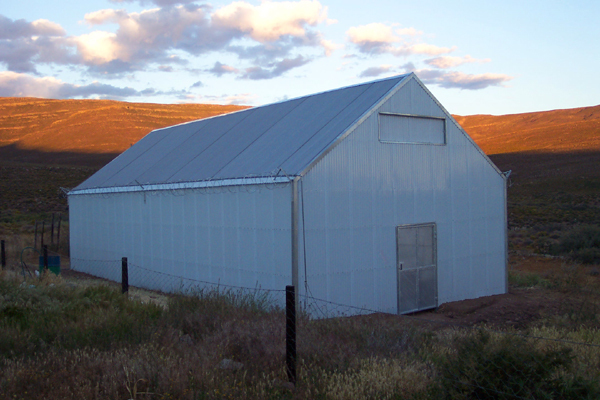 It is all plateau, offering excellent future grazing potential and wildlife viewing opportunities. A lot of hard work lies ahead! Red hartebeest are historically re-introduced to Komsberg East for the first time in approximately 200 years. Kudu are released to Komsberg West's main valley area. Springbok are released to three sections of Komsberg West. Grasses have recovered on Komsberg Wilderness Nature Reserve sufficiently to now go ahead with the re-introduction of large grazers. The sheep were taken off three years ago. All the perimeter fencing has now been completed and all the internal camp fencing has been removed.